Welcome to the For Midwives section of the website. Here you can find out about the numerous roles and services the College offers, including booking education workshops and Midwifery Standards Reviews. The vote which closed on Friday 12thApril, will see a majority of members gaining increases of up to 17.5% from where they are now ($66,755 a year) to where they will be in August next year ($78,353 a year). As a member of the College you have the opportunity to contribute to all the representations the College makes to government, health organisations, consumer groups and the public. The College encourages and values individual member input very highly. You can also take an active role in supporting your local and regional midwifery community including joining with consumers and their organisations to support initiatives that enhance the lives of mothers and babies. The Find your Midwife website, created by the New Zealand College of Midwives to help women to find a midwife they can work with best. The MMPO was established by the New Zealand College of Midwives in 1997 to provide its LMC (Lead Maternity Carer) midwives with a supportive practice management and quality practice system, enabling high quality continuity of care for women throughout New Zealand. MERAS has been established as a dedicated and focused union for employed midwives with support from the New Zealand College of Midwives. 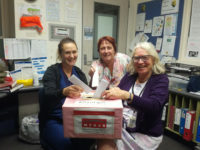 A national District Health Board (DHB) midwifery collective employment agreement for employed midwives has been negotiated and is now in operation for MERAS members at DHB’s.